Does your doggy friend have really long nails? Well, you need to invest in the best dog nail grinder for your furry little baby! Cutting your dog’s nails can be a really tricky thing. After all, you can end up hurting your friend and making the process really painful and traumatic for him. So, today we’ll cover the best dog nail grinder reviews, why even choose nail grinders and how to correctly cut your doggy friend’s nails! So What Are Dog Nail Grinders? How Are They Different From Dog Nail Clippers? Are you a new dog parent? Well, then this is something you should know. Manual tools are something that has been around for a long time but, they aren’t the safest and most convenient option out there. They also become less effective with time as the blade gets blunt. Did you know that a weak clipper could crack a tough nail and even cause pinching!? That’s really awful for your doggy friend! After that comes the problem of choosing the right product for your doggy’s little paws. It’s like Cinderella’s glass shoe! If it’s too big or too small, it’ll hurt your little pooch. And, finally, there’s the issue of you cutting up the nail too high and ending up hurting your little doggy. Well, that’s where nail clippers come in handy. In fact, most professionals like the vet or groomers seem to agree on the fact that electric nail grinders are better for your doggy than the traditional nail clippers. Well, the grinding of the nails using these nail grinders is simply more precise. This also reduces the chances of pressure, breakage or cracks on your doggy friend’s nails. 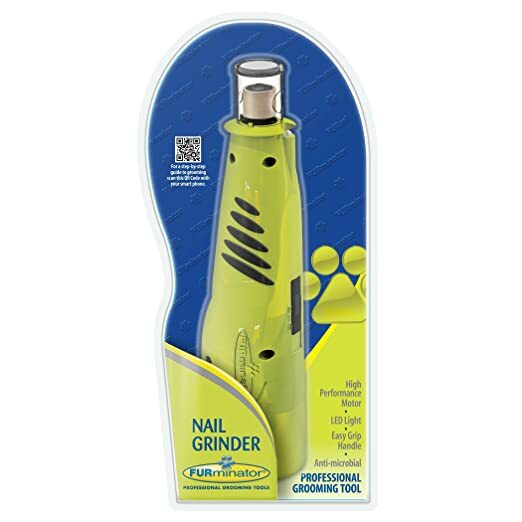 Some nail grinders also come with a tool that which polish the nails to help prevent rough edges. This means that there won’t be any scratching or snagging. I feel that a dog nail grinder is the best alternative to nail clippers. What Are The Common Problems Faced When Using Nail Clippers? Now that I’ve introduced you to nail grinders, let’s talk more about them. There are numerous reasons why dog parents (and groomers!) have been switching to nail grinders in the past few years. I’ll go over them in order to make you understand why investing in the best nail grinder is such an important thing — for your pooch’s sake. I’ll cover two major points in this. Every dog who’s gotten his nails chopped using a trimmer has had at least one painful and traumatic incident with them. You can hit me up in the comments if you think I’m wrong. In fact, most dog parents really don’t like getting their doggy’s nails trimmed because something like this has happened to their furry friend. Regardless of the groomers experience, nail trimming is a traumatic experience for the doggy. It can even cause the furry bundle of joy some amount of pain. So, guess what most dog owners like to do? They like to simply postpone trimming their doggy’s nails. But this causes more problems! That’s because the more you postpone trimming, the harder it gets for the groomer to bring the nails back to their original shape. This, in turn, becomes more painful of the doggy. And if you’re a dog parent, you just know how your doggy friend just hates every second of nail clipping. And sometimes, you even think that your dog may be mentally cursing you! Did you just mentally sing the Jessie J. song ‘Price Tag’? First of all, to get your doggy’s nails trimmed you’d want to go to an expert groomer. And they don’t come free of cost! The more experienced the groomer, the more expensive they are. And, even with all that experience (and money! ), you can’t guarantee that they won’t hurt your baby! And, going to some rookie groomer isn’t a good idea, either. Yes, the costs may be low, but they may come with some free bleeders and a whining doggy. Option two is trimming your dog’s nails yourself. But, first off, you aren’t an expert! And, you’ll feel far too worse if you’re the one who hurt your doggy. Secondly, nail clippers have the tendency to get blunt awfully fast. So, you’ll have to keep throwing your money to buy new ones! Is Dog Nail Grinder The Best Alternative? This is till date an easier and a more efficient method to trim your dog’s nails. Apart from that, this is more practical for both, the dog and the owner. In fact, this is probably a painless (and mess-less) alternative. With nail clipping, the problem is that it can lead to psychological problems in the dog which down the line can turn into behavioral issues. These can simply be avoided by using nail grinders. Why Do People Switch To Dog Nail Grinders? I hope that I was able to highlight the problems with nail trimming and nail clipping for you. Now, I’ll quickly discuss the reasons for the switch before moving on to the best dog nail grinder. I’ve got a doggy of my own who’s got a tendency to grow long nails. And, he’s playful in nature. You can guess what happens! He ends up scratching everyone and everything he comes in contact with. And, it’s not even his fault because he’s being playful. But those nails hurt us all really badly. And he hates nail trimming. So, we switched to grinding those nails and everyone’s happy. Doggys with long nails tend to harm themselves as well when scratching. I remember how my dog used to bleed after having scratched himself on the same spot! Another reason for making the switch is the furniture! You have no idea how many times my dog has ripped our leather lounger! And that thing is so expensive! Let’s finally get to the review, shall we? I’ve hunted down the best of the best dog nail grinder available in the market so that you don’t have to! You can thank me in the comments section later! And, to make things even easier for you, I’ve made a table that’ll help you make the right choice! If you’ve got multiple pets, then this will work for each one of them! This is cordless, small and really silent. So, rest assured it won’t freak your doggy friend out! You’ve got to try this one! 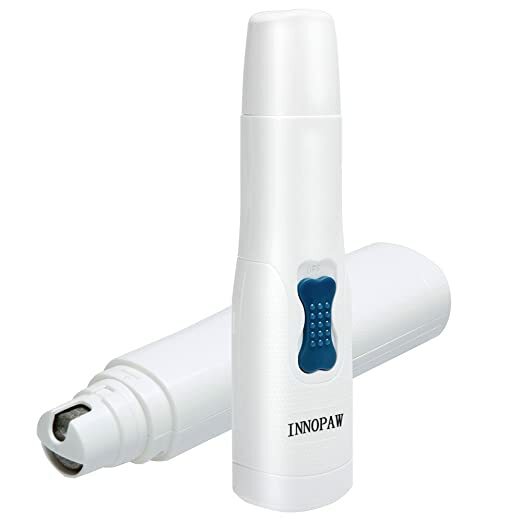 Innopaw dog nail grinder is also a good option for your doggy friend! This is an effective as well as a silent solution. Made for dogs, it comes with three different ports for three different sizes of dogs! It also uses 2 AA batteries so that you don’t have to buy battery packs! This is a good dog nail grinder available in the market! 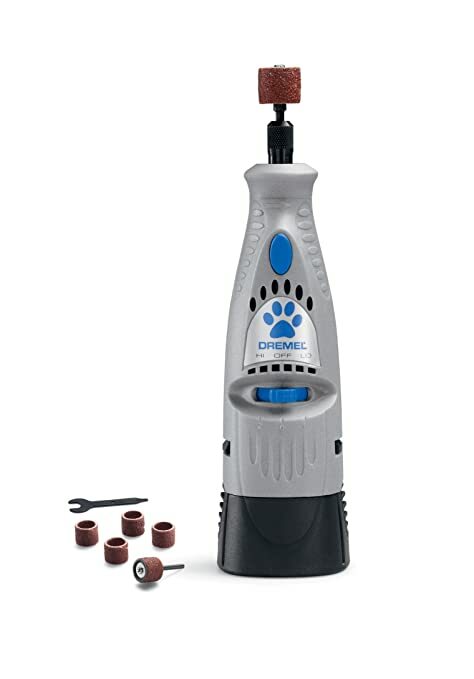 The Dremel nail grinder is one of the best available in the market. I feel that this is well worth the money as it works really smoothly in a way that makes sure that there’s no nail splitting or breaking. The higher speed is better for a quick trim, while the lower one is better for a ‘deeper’ trim. And, the noise it makes doesn’t really bother the doggy! All in all, this is one of the best dog nail grinder in the market! Worth the money you pay. 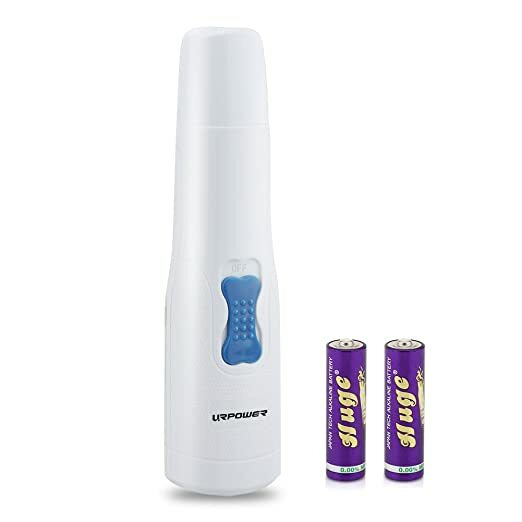 UrPower nail grinder is a compact and powerful dog nail grinder available in the market. This one is really silent and gets the work done quite effectively. It’s also very light in weight. If you’ve got multiple pets, then it’ll work for each one of them! From birds to rodents to dogs and cats! I feel that this is one of the best dog nail grinder in the market! The Furminator nail grinder is also a great option to go with! Don’t judge it by the looks! This nail grinder works very well and is surprisingly very powerful for its size! It can even trim the hardest of nails and comes with extra grinding belts! Using a nail grinder isn’t rocket-science! It’s very easy to learn and to do! I’ll help you with that as well! I hope I was able to help you find the best dog nail grinder for your pooch! Nail grinders are better than nail clippers every day. They are easy, quick and painless ways to chop those nails and keep your doggy happy. I’ve picked out the top five best dog nail grinder available on the market today and told you a bit about they to make things easier for you. I hope that I cleared all of your concerns. Please, do leave comments if you have any questions! I’d love to clear anything you’ve got in your mind up! And don’t forget to share this post with your friends!